EXTREMELY FINE. 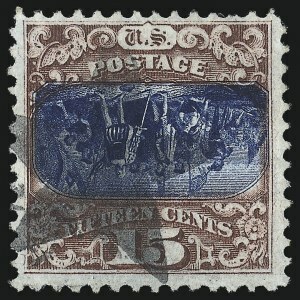 THIS STAMP IS WIDELY ESTEEMED AS THE FINEST USED EXAMPLE OF THE 15-CENT 1869 PICTORIAL INVERT EXTANT. THE COLORS ARE REMARKABLE, THE MARGINS ARE WIDE ALL AROUND, IT HAS A STAR FANCY CANCEL, AND IT IS COMPLETELY SOUND. A TRULY REMARKABLE STAMP. Our census of 1869 Inverts, published in the February 1999 Chronicle and updated with three new stamps, contains 93 examples of the 15c Invert, including three unused and 90 used (one in the British Library's Tapling collection). Fewer than a dozen examples are sound, and this is considered to be the finest truly sound stamp. Census No. 119b-CAN-NC-03. Ex Moody, "Ambassador", Wunderlich, Kantor and Koppersmith. With 1971, 1986, 2001 and 2010 P.F. certificates. EXTREMELY FINE. 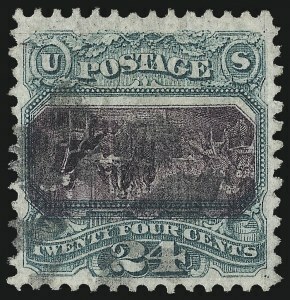 THIS STAMP HAS BEEN WIDELY ACKNOWLEDGED AS THE FINEST USED EXAMPLE OF THE 24-CENT 1869 PICTORIAL INVERT IN EXISTENCE. THE COLORS ARE FRESH, THE MARGINS ARE BALANCED, THE ROSETTE CANCEL IS LIGHT, AND IT IS COMPLETELY SOUND. A TRULY PHENOMENAL STAMP IN EVERY RESPECT. Our published 1869 Invert census (with unpublished updates) contains 89 copies of the perforated 24c Invert, including four unused stamps and used multiples. Of these, only five qualify as "centered" and of these four are either reperfed or have margins added. This stamp stands alone as being sound and centered. Census No. 120b-CAN-C01. Ex Moody, "Ambassador" and Grunin. With 1999 and 2010 P.F. certificates. EXTREMELY FINE APPEARANCE. A RARE EXAMPLE OF THE 30-CENT 1869 PICTORIAL INVERT WITH WIDE-SPACED TOP AND BOTTOM MARGINS AND A FRENCH TRANSIT CANCEL. Our published census of 30c 1869 Inverts (with unpublished updates) contains a total of 45 stamps, including 7 unused and 38 used. 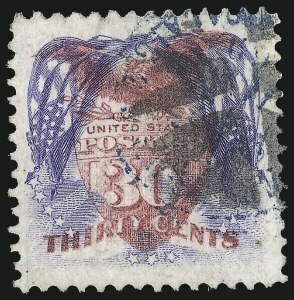 The stamp offered here is one of five in the Wide-Spaced centering category (see Chronicle No. 138, May 1988, page 123). The Wide-Spaced stamps have extra wide top and bottom margins. Census No. 121b-CAN-WS01. Ex McKinney. With 2010 P.F. certificate.